Sítio Roberto Burle Marx is part of the Tentative list of Brazil in order to qualify for inclusion in the World Heritage List. About 40 km west of Rio de Janeiro center, this site is a botanical park and museum dedicated to Roberto Burle Marx, a famous Brazilian landscape architect and avid collectors of plants and trees. Along with Oscar Niemeyer, Burle Marx achieved several modernist projects in Brazil, some already inscribed on the World Heritage Site: Pampulha Modern Ensemble in Belo Horizonte, Brasilia, Rio de Janeiro (specifically for Copacabana pavements and Flamingo Park) along with the Palais de la Culture in Rio, which is on the TL. It is planned for inscription for 2020. 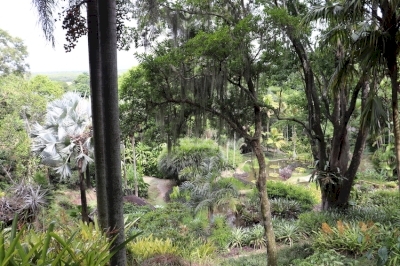 In 1949 Burle Marx and his brother bought this banana plantation and slowly transformed the property into an extraordinary botanical landscape with an impressive collection of tropical and subtropical plants. He built a small house with contemporary features, and lived there from 1973 to his death in 1994. Several other buildings dot the park: a 17th century renovated chapel, a visitor’s center designed by Burle Marx when he donated the park to the Brazilian state, and a “atelier” in which he planned to teach, but never had a chance to. Nowadays lectures and concerts are held in this last building. His house now displays an emotional tribute to the artist, with personal objects (his bed, with his glasses and shoes, his piano), his work (statues, paintings, drawings, tapestries, textiles, murals) and his collections (pre-Colombian ceramics, catholic religious artifacts, shells and fossils). The most interesting part if of course the garden, with more than 3000 species of cultivated plants. It takes about an hour and a half to walk around the park. Plants and trees are of all size, colors and smells. It mixes native vegetation and the huge collection of indigenous tropical plants from Brazil. All plants have been planted to form an interesting landscape, with pounds, reflecting pools and artificial waterfalls. Visit is by guided tour only (closed Sundays and Mondays, 35 people on each tour), and need to be previously scheduled (by phone) and costs 10 R$. It lies an hour drive from Rio center, about 40 km west, and is accessible by public transport. Not wanting to venture far out of the city center by myself on public transport, I went in a guided tour from my hotel, reserving it on the internet. I was very lucky, because I ended up with a private tour, on a Sunday, with only three of us, being driven to the sitio, and having a biologist-guide to show us around (three people instead of a 35 people usual tour). Of course, this option is more expensive but I found it really worth its costs (btw the guided tour was on www.wowtour.com.br or by what'app +55 21 99135-1648). I would recommend a visit to this very nice place, and I believe it has a good chance at inscription.